Henry Candy described Twilight Son as "a natural" after the colt stylishly maintained his unbeaten record. With the Wantage handler having decided against running Limato on Merseyside, his rather less-vaunted stablemate proved a beautiful foil to give journeyman jockey Fergus Sweeney a first Group One triumph after 20 years of trying. Caution is often Candy's default setting, so it was perhaps understandable to hear the trainer express "a great sense of relief" after Twilight Son was successfully hurled into top-class company after winning summer handicaps at Newmarket and York. It was, however, a closely-run thing. This season's Betfred Cup always had the look of a tight race, and, for once in racing, it went to script. Strath Burn and Twilight Son (10-1) arrived at the line in unison, but in vastly different ways as the former came late and fast, while Sweeney's companion flashed past the furlong pole with his head in front. A terrific bob-and-weave finish resulted in a anxious photo-finish, but a raised clenched fist from Sweeney after the short-head verdict was called was as knowing as it was celebratory. He said: "I thought I'd got it, but I still wanted to hear my number called. "I'll be singing half the way home. Hopefully I'll get a bottle of bubbly open at some stage." He added: "He's done nothing but improve all year, he's an absolute star. He really wanted to win and full credit to Mr Candy. "I thought this level might come a year too soon, but I couldn't believe the ease in which he travelled into the lead. "I'd have loved to have a lead for a bit longer, but nothing was good enough." For Twilight Son, the chance of more Group One gains in the Qipco British Champions Sprint at Ascot is now upon the horizon. And despite having been snaffled up by Cheveley Park Stud for future stallion duties, there is also a distinct possibility racegoers could see him again next year. Candy, who also trained Twilight Son's champion sprinter sire, Kyllachy, said: "I thought I might be made to look incredibly stupid, but Fergus said he was incredibly tough. "He said he couldn't believe the ease in which he took him into the race. "I wish I'd taken a picture of him last year as he's twice the size now that he was then. "He's a natural. He was a baby for a long time - he just needed time. "I think he might have one more run, the championship race at Ascot would be the logical next run and then hopefully next year as well." Strath Burn's trainer Charlie Hills was slightly rueful, but no less magnanimous in defeat as he was also responsible for the third horse home, Magical Memory. 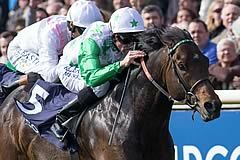 The Lambourn handler said: "I am delighted, I'm really proud of both horses. "The winner is a very good horse, he has beaten us three times this year and it was an exciting finish. "The draw wasn't ideal for Strath Burn, so he has done tremendously well to get where he did. I've always loved him and he has a lot of class, he can only get better. "Magical Memory looked like winning for a good way, the ground is probably a bit tacky for him, but I couldn't be more proud of them."